Thanks, Matt. They didn't load up my snapshot for the live stream, so this time I'll do a save file. Easy to miss, and Greg didn't spot it either. (Take note techies - best to not confuse the devs with non-snapshot images and hidden snapshot attachments. ) Although it would be good (@Matt) to have the streaming setup ready to show videos, seeing as the Com Core instructions expressly ask for them (and @cipher clearly took some time to make a couple with music, etc). Also, @Matt - to clarify: you seem to be a little unsure/unaware of the difference between techs that use hover plates as intended, just to hover a fixed height off the ground. (There are, or were, a load of hover plate techs already in game as enemies, that worked OK, driving like slidey, floating cars.) Verses "hover-bug" techs - hover plates pointed at a tire for constant activation. When this trick is used to let techs float up to any height, like an airship, or to change the control schema for helicopters, etc. Quack's tech doesn't appear to use the hover-bug at all. Just hover plates as intend. Even techs that do use the hover-bug can still control just the same, like a 'car'. Because activated hover plates keep the tech in a 'grounded' state, it prevents flight controls while up in the air, so the AI can use the fans for regular turning control, etc. It's not necessary to use [Shift] for, as with a plane of a helicopter, just regular steering. Anyway, here is a hover. So it definitely could be used in the enemy tech population, without looking or behaving in a buggy fashion. Ironically, Quack's tech behaves more stably than some of the (old) hover plate techs I've seen (which are admittedly now all broken by the huge buff to plate strength). Of course, the final decision on what goes in is down to @zanzistar and I'm not sure if you guys have been deliberately removing all hover plate enemy techs from the game (without intention to replace them)...? I noticed the one from the main menu brawls was removed, for example (probably just pre-empting the hover buff). Also, I'd like to point out that there weren't any level 1 Venture techs in the last submission thread. In fact, at least 90% of them were level 3, because the batteries and shield bubbles are level 3 parts. As far as I understand the enemy spawning rules, it is almost certain that none of the submissions will show up before players hit Venture level 3, or max level, even (@zanzistar?). So, (a) if the devs want community made techs better spread across the grades, you will have to make these factors clear in future. (I'm thinking that you didn't, this time, as all the weapons and wheels requested where level 3 and some 2). Sorry to hi-jack this new Com Core thread; I didn't want to use mod privilege to reply on the old locked one, but I can move this feedback comment there if the devs want (or shut up in general). Thanks for clearing that up, ZG. And for simplicity next time if using a snapshot I'll also include it as the first image (even though snapshots don't look nearly as good as screencaps can look). I'm clueless about the difference between the level 1, 2, or 3 techs for enemies. Is this documented somewhere? Next time I'd be happy to make several level 1 or 2 techs for the cor submission. Will be fun to have some limits to see what we can do with within them. The tech with the battleship cannons on it wasn’t meant to be a submission for an enemy tech - I just got a little carried away while making the first one and decided to submit a second tech because I liked it. However, the other tech is made completely from Venture blocks and it is a proper submission for an enemy tech. Quack's tech doesn't appear to use the hover-bug at all. Just hover plates as intend. That is true. I wanted to make a completely normal hover tech as an enemy just to add some variety. Seeing wheeled tech after wheeled tech for hours on end gets very boring. Next time I'd be happy to make several level 1 or 2 techs for the cor submission. I'm not sure how the game filters it exactly, but we've been told (and it seems) that as a rule of thumb you don't get enemies with blocks you've not unlocked yet. (Aside from invaders.) Also, their total value is capped by your GSO level (I think). And there may well be a bias towards the types of blocks you currently have on your tech(s). But I'd guess the devs don't even know which enemies get spawned (the most) in practice, unless they've done extensive internal spawn tracking or experiments... And maybe they'd prefer to design more of the lower level techs in-house, as they are seen more. Or there's a lower need for them, or something else. Just assume that instructions won't be read during the stream itself (there's so much else going on for the devs to look at), and set your saves and expectations accordingly. I don't think there was any real problem with yours. I'm sure your intended tech will go to population and the other one at least gave Greg something to fiddle with. Mebby I'll remove the bubbles to make a real Morgorg. Edit because I made something "cool:"
New Save attached. Contains two four more submissions(Yes, I know I'm breaking the rules with 5 techs. But it's a set, okay? )(If you must, just don't show the Morgorg(attached snapshot)). Glorsgaurde Protectors: Maybe spawn in some enemies to fight? I dunno. Apologies for my ignorance there @QuackDuck. I assumed that 'funky techs' covered all the bases. I'll make sure future instructions are crystal clear. It's a great looking tech though! We asked for no 'funky hover techs' on the basis that we didn't want any hover or flying techs. So you're right it could be added to the enemy population but isn't what was requested. Also, I'd like to point out that there weren't any level 1 Venture techs in the last submission thread. In fact, at least 90% of them were level 3, because the batteries and shield bubbles are level 3 parts. Again, we asked for the new Venture blocks to be used for a reason. I know it may not seem like it most of the time but we really do know what we're doing. Honest! I know it may not seem like it most of the time but we really do know what we're doing. ... I think maybe a few of us would appreciate being told what factors are currently hard limits preventing techs being used for the enemy population. e.g. (1) Are all hover techs excluded (or filtered out)? (2) Do exposed anchors exclude a tech? - I've been suspicious that this factor might be tripping up otherwise great mobile enemy submissions, after things @zanzistar has said elsewhere about how techs are spawned into campaign. Feel free to 'kick me under the table'. Honestly that list would be far too long and boring. This is why we have certain criteria for each population comm core. It's easier to ask for what we need than list what we don't. Honestly that list would be far too long and boring. I'm not saying that you devs should (or could) document every judgement call that comes into play in deciding what goes in. Nor justify individual calls, nor confirm status of individual submissions, etc, etc. I'm only talking about the half dozen quantifiable hard limits against general population techs, that might be a trivial stumbling block for otherwise good submissions. Anchorable(?) - more of an issue for generally submitted campaign techs. Too many extra lights (as they cause disproportionate FPS loss - I advised using fewer than 6 in the base submission thread, but it could be more or less strict). 45 degree build angle (so AI would continually pick itself up in build beam). Specific blocks (payload terminals might be excluded now, for example?). "ZG Gremlin" - save file (optional) includes enemy versions to fight. Cute, practical campaign runabout and enemy population submission. Take off in a straight line. I was inspired by Aardvark123's mech-like tech in the last submit, and since we had very few low-level submits last time, I'm submitting four low-level mech techs for this round. R&D Save File is attached to this post. Low level mech techs that might be fun (and easy) to destroy. This is a helicopter selection for you to mess with. 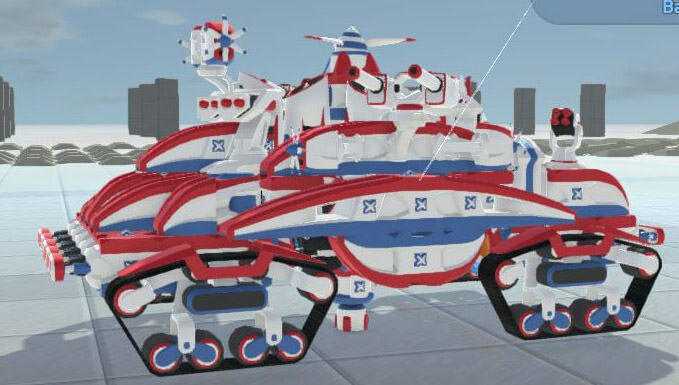 There is 4 techs to showcase and all have the same helicopter control scheme (hoverbug controls). The new variant of the 'Announcement Guy can fly too but he isn't for showing off (you can if you want). And yes, this is the save that I posted last week with a slightly different selection. Two of the copters are the same but 2 new ones have been added. Also, the previous podium was removed because the announcement guy seemed to jump off when the save was reloaded. SHIFT TO GO UP, WASD TO MOVE, X TO DETACH PLANES.